Kyra has been a student at Cornerstone Music Conservatory since she was 3 years old. She is a talented pianist, vocalist and flutist. She will be performing at Cornerstone on April 15 at the special Graduating Seniors’ Recital. You will enjoy hearing more about Kyra. You were only 3 years old when your Dad started bring you to Cornerstone. Do you remember anything special about that period of time? Some of my earliest memories are of Cornerstone. I specifically remember singing the Good Morning and Goodbye songs, marching around the room with my dad, and playing various percussion instruments, always with a big smile on my face. When do you remember first developing perfect pitch and how has that gift helped you with your music and musicianship? I don’t know exactly when I developed perfect pitch, but I have been told that Miss Annie (Ann Pittel) discovered that I had it. Having perfect pitch has been tremendously helpful for learning music by ear and memorizing it, and a little annoying if anyone sings off-key. You completed the entire Harmony Road Music Course. What aspect of the Course do you feel helped prepare you best for the musician that you are today? Harmony Road’s emphasis on solfege and basic music theory has been very beneficial to me. I can instinctively pick up on complex rhythms and harmonies that others in my choir or orchestra struggle with. I remember sitting at the keyboards every Wednesday afternoon, with a group of other kids including my sister. We would all have so much fun playing songs together, and sometimes we would get to play solos, which I loved. I remember the excitement of finishing a book in the Harmony Road series, our Halloween “C food” parties, and setting all of our keyboards to different instruments so we sounded almost like an orchestra. These are some of my fondest memories. Besides piano and voice, why of all instruments available did you decide to take up flute? 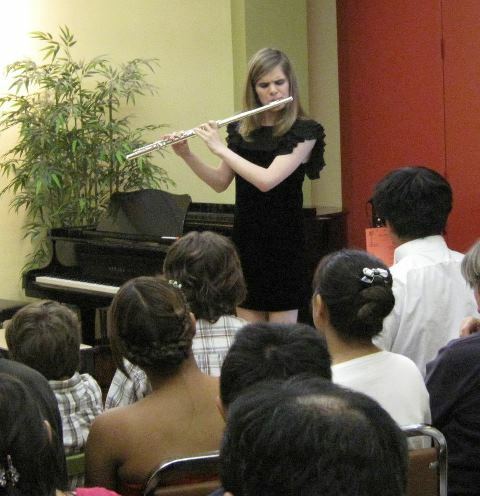 I decided to play the flute at an assembly in the fourth grade, where different instruments were being demonstrated. As soon as I heard the sweet, light tone of the flute, I knew I wanted to learn to play it well. What is the most enjoyable thing about playing the flute? The flute is such a unique instrument, because it can be lyrical and expressive, and it can also be flashy and technical. It gives me the chance to both express and challenge myself. What is the most difficult part about playing the flute? The most difficult thing about playing the flute is that it is such a popular instrument. Band and orchestra directors often do not want many flute players, because the flute’s high sound can affect the balance of the group. Therefore, it is very competitive. You play take piano. Voice and flute lessons and participate in your High School Band, a community chorus, and a community orchestra. How do you possibly manage to practice for all these lessons and groups and study for school as well? Having time to practice for all of my musical commitments and also to do well in school involves sacrificing leisure time that many young people take for granted. I almost never watch TV, and usually can’t spend hours at a time on Facebook. Why have you chosen to make music such a central part of your life? One reason why music is a central part of my life is that I was exposed to it at such a young age at Cornerstone, and that exposure was positive and rewarding. Music gives me a creative outlet, which I believe everyone should have. I also enjoy the process of striving for musical excellence, and perfecting every detail of a piece. Some of my best friends are people I have met through playing music and singing in a choir. Have you won any musical prizes or honors? I was recently one of the winners of the Young Musicians competition. This means I will have the opportunity to perform a concerto with the Palisades Symphony in June. Is there anything you haven’t liked about being so involved in music? It is sometimes difficult to balance music with schoolwork. Tell us about your experience reading Braille music. Miss Annie and I spent years working together to learn the Braille music code. I am now fairly proficient at reading it, but still prefer to learn music by ear. What is your favorite kind of music to play? I enjoy playing classical music. I enjoy listening to a variety of genres of music, from classical to popular to jazz to country. Do you have any funny stories to tell about your music life or music education at Cornerstone? When I was very young, I had trouble grasping the concept of not playing during rests or while Miss Annie was talking. I remember my dad often having to take my hands away from the keyboard. Also, Miss Annie and I both have a tendency to tell jokes and puns, which leads to lots of laughter during my piano lessons. Last week, we decided that I should “go Bach home and Handel my Galuppi piece or next week I would be Haydn”. Did you have any worst moment? I don’t recall a worst moment. You will be going to college soon and are planning on majoring in something other than music. Do you know what you are thinking of majoring in and what profession you are interested in? I am thinking of majoring in either psychology or English. I am considering a career as either a psychologist or a lawyer. Will you continue pursuing music to some extent during college? If so, what are you thinking about doing? I will definitely pursue music in college. I am thinking of joining a choir and an orchestra, and possibly an a cappella group. Do you have any other interests or hobbies? Although music takes up a lot of my free time, I do have other hobbies, including reading, skiing, and hiking. Are you involved in any social groups or causes or community service? I sometimes do volunteer work for my preschool, called the Blind Children’s Center. I play the flute and sing for the children, speak to their parents about blindness, and transcribe print books into Braille. You have been attending our school for over 15 years. In a few words, how has Cornerstone Music Conservatory helped you with your music and in your life. My 15 years of excellent musical training at Cornerstone have put me at a significant advantage when it comes to music. I feel that I have a greater understanding and appreciation of music than many of my peers. Cornerstone has also helped me grow and progress as a musician. In piano, I have gone from struggling through “Twinkle, Twinkle Little Star” to playing sonatas. Taking lessons from Keren has vastly improved my flute sound and technique. Miss Annie (Ann Pittel) and my other voice teachers have worked with me to improve my singing voice, which used to be soft and breathy and is now more powerful. Whether one becomes a musician or not, what do you think the advantages are of having a great music education available when one is in his or her formative years? I believe that everyone should be given the opportunity to have a quality music education. It teaches valuable skills like patience, self-discipline, and perseverance. With all of your experience, what is the best advice you can give to other Cornerstone Music students? Never say that you “can’t play” a piece, because you almost certainly can, if you put your mind to it and practice enough. Also, remember to have as much fun as possible when you perform.